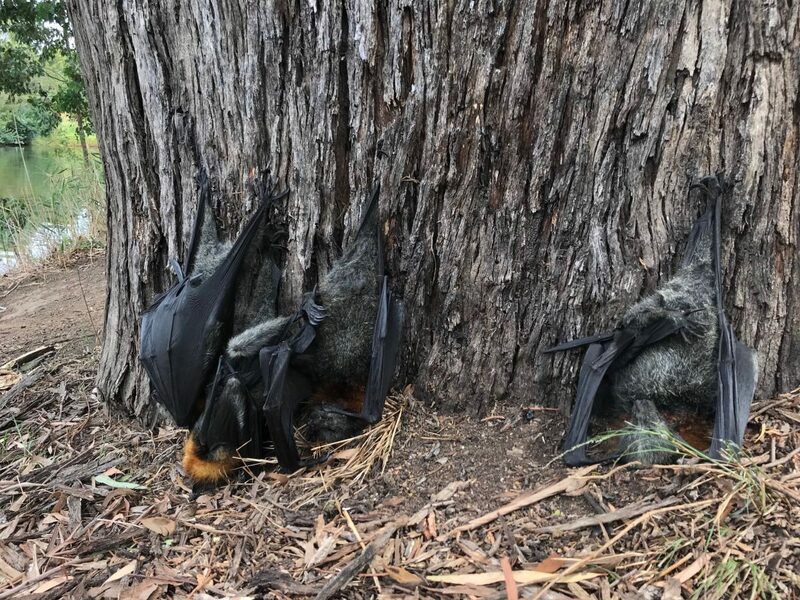 The tragic news of the loss of one third of the grey headed flying-fox colony in Bairnsdale – due to the excessive heat of Friday 25th when the maximum temperature of 45.8 was just short of the record* – was widely reported across the media. This included mainstream media reports in the Guardian, the Age and the ABC through to a front page header in the local throwaway, the East Gippsland News. Of all the reports I have read only ABC Gippsland journalist Emma Field mentioned climate change as a contributing factor. She tweeted: “More than 2,000 flying foxes die from heat stress in eastern Victoria. I read a flying fox expert [who] calls these events the ‘canary is the coal mine’ for climate change.” The tweet was a link to her online article on the event which unfortunately did not include any reference to climate change or the ‘flying fox expert’. The implications of Field’s ‘canary in the coal mine’ quote are not spelled out and the expert she is referring to is Justin Welbergen. ** Welbergen used the metaphor in the title of his 2014 conference paper “Canaries in the coalmine: flying-foxes and extreme heat events in a warming climate”. The paper dealt in detail with the overwhelming evidence of global warming and how this increased the likelihood of extreme hot days occurring. The paper stated that “The probability that a grey-headed flying-fox will encounter temperatures greater than 42C has increased almost three-fold since the 1970s” and that besides climate change, man-made factors threatening flying-fox populations included “ongoing loss of foraging and roosting habitat”. As well as adversely affecting our carbon store the intensive clear fell logging practiced in Gippsland for the last 50 years has also severely restricted the flying-fox options of food and home. The original ‘canary in the coal mine’ metaphor was a practical way for coal miners to protect their safety. The dead canary was an advanced warning of danger. As used by Welbergen the metaphor, exemplified in the current die-off, is an otherwise unspoken warning to Gippslanders and all humanity. It is we who are being warned. If climate change can decimate the flying-fox populations we almost certainly will be next. ** I have Lisa Roberts of Bairnsdale Friends of Bats and Habitat Gippsland group to thank for providing me with the Justin Welbergen paper. An earlier paper published by the Royal Society can be found here.